For a long time, it was a common belief in the gym that you needed to get some protein in immediately after your workout if you wanted to maximize muscle growth. 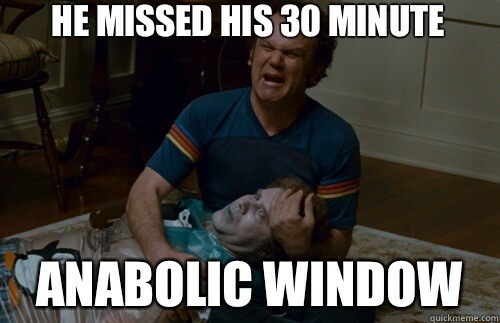 The idea was that there was an "anabolic window" when your muscles were most sensitive to taking the protein and building new tissue with it, and that this window lasted for perhaps only an hour or so. If you didn't get your protein in at this time, you would impair your gains. A few years back, Brad Schoenfeld and I published a paper to examine whether this was true. It was a meta-analysis, where we gathered a bunch of studies that looked at protein supplementation around weight training sessions, and then used statistics to see if there was any sort of trend across all of these studies. We found that extra protein was the strongest predictor of your gains, regardless of whether you consumed it immediately around your workout or not. We failed to see any timing effect, but one of the limitations of our analysis was that there was only a small number of studies that directly tested timing. In other words, if you want to test the effect of timing, you need two groups: one gets extra protein right after their workout, and the other gets it as some time point much later in the day after the "anabolic window" has supposedly closed. Most of the studies in our analysis did not do this; they simply gave protein or a placebo, which isn't really a test of timing. Realizing this limitation in the research, we decided to do a study that directly tested the impact of timing. We're happy to announce that the results of this study have now been published. We took 21 men with resistance training experience and assigned them to one of two groups. One group got 25 grams of protein immediately before their weight training sessions, and the other group got 25 grams immediately after training. They trained 3 times per week for 10 weeks. We measured changes in body composition, muscle thickness, and strength. Overall, we found no differences in strength, muscle, or body composition changes between the groups. Our results would suggest that, as long as you have some protein at some time reasonably before or after your workout, it's not going to matter in regards to your gains. We would call this a "peri-workout window". Most of us spend our day in a fed state and are eating protein every 4 hours or so anyway. If you have lunch, then go to workout 1-2 hours after lunch, you don't necessarily need to consume protein right after your workout since you've already had some protein before it. If you have an afternoon snack 1-2 hours after your workout, you'll have consumed protein at the beginning and end of an approximately 4 hour window anyway. Protein timing may be more beneficial to individuals who do not consume protein very frequently, such as intermittent fasters, but that's a hypothesis that remains to be tested. There were limitations to our study. We asked our subjects to consume a caloric surplus, but they ended up in a slight deficit. Thus, our results might only apply to people who are dieting. Our sample size was small, which limits our statistical power to detect differences between groups. Thus, we can't rule out very small benefits to changes in timing. Still, there wasn't even a hint of a tendency for better gains in one group compared to another. "Previous work recommends covering the bases by ingesting protein at 0.4–0.5 g/kg of lean body mass in both the pre- and post-exercise periods (Aragon & Schoenfeld, 2013). This seems to be a prudent approach in the face of uncertainty regarding the optimization of nutrient timing factors for the objectives of muscle hypertrophy and strength." The bottom line is that, if you're consuming a good dose of protein at regular intervals through the day, with some at some point before your workout and then again at some point later, there's no need to perfectly time your intake immediately before or after your training. While more research is needed, the data currently suggests that the anabolic window is more like an anabolic barn door. I would think that a lot of people who are on an IF pattern would want to know if this study makes any impact to their rule of not having (non-bcaa) protein before their workout. Any comments? I have a question but mainly on pre and post workout meals.. I hear from a lot of people that you should only consume carbs and protein pre and post workout while keeping fats to a minimum (no higher than 8 grams), to accelerate the process of protein synthesis.. Does this really matter? To me food is fuel and as long I have great energy for my workouts and fuel myself afterwards with a balanced meal of carbs, protein, and fats is what matters to me..